There is an old riddle that asks, what is the value of a human body? It goes on to enumerate the quantities of the various chemicals that constitute an average body, and then price those chemicals to come up with a total material value. This might come as a shock to the one who tried to answer the riddle, because the value is so low. Of course that analysis ignores the real value of the body because it ignores the spatial arrangement of those chemicals in the various tissues and organs of the body. It ignores the form of the body as an hierarchical arrangement of structured parts. These parts are very valuable for someone needing an organ donation, for example. 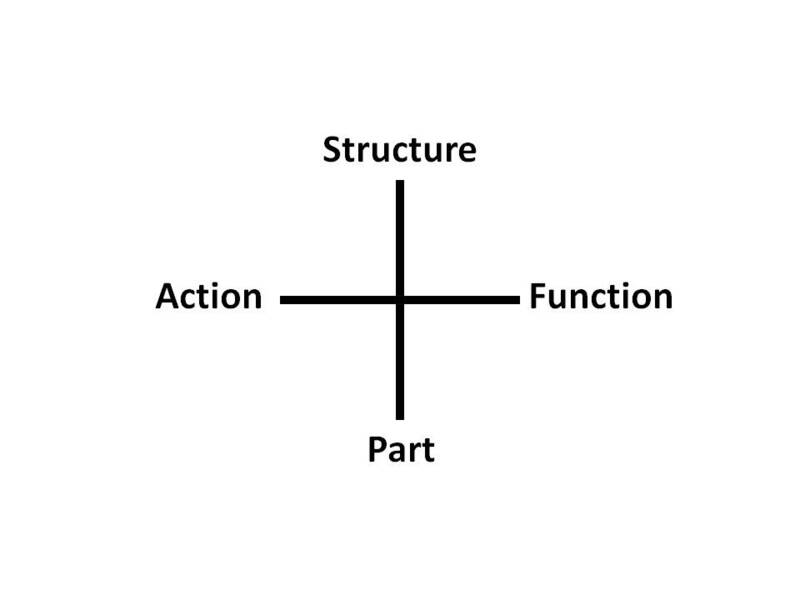 This static analysis is lacking as well because it neglects the dynamic actions that a body can perform. Taken as a set of discrete individual acts, this is like considering the individual chemicals that constitute a body. One can enumerate the acts too, as in counting the number of breaths or the number of heart beats over a lifetime. But we are still not finished, because this enumeration of actions also overlooks the functions that a body can perform, as arrangements of actions in time. These functions are the most important value of a body because they include but are not limited to being alive, thinking, and feeling. So it seems to me that there is a heirarchy here, that goes from parts to structure to actions to function, with parts being at the lowest level and function being at the highest. Each level of the hierarchy is dependent on the level below, but the nature of a level is fundamentally different from the level below it, as well as the level above it. Please see my previous post Structure-Function. The term “equivalent exchange” comes from an alchemy-centric anime, where through a process called “human transmutation” it is attempted to recreate a body starting from a pile of the basic chemicals that constitute it. Even with some high-powered magic, the attempt fails due to the fact that much more is required to fashion a body or even a living, breathing person. Don’t take more than you give. You scratch my back, and I’ll scratch yours. Energy is neither created nor destroyed. I’m sure many more can be listed. I invite my readers to submit them. These are all conservation laws: total value is maintained, even while it changes hands. And they certainly seem to be “conservative”: all things being equal, they usually hold. That being said, this blog isn’t specifically about “equivalent exchange”, except for hopefully obtaining the value of knowledge for the effort expended. Instead, I hope to explore a common thread that runs through philosophy, logic, and semiotics in the form of “double duals” (which themselves seem to have the property of equivalent exchange), with the goal of understanding and classifying different philosophical subjects and systems, exploring the nature of pluralism, and enhancing dialogue between opposing viewpoints. The image of the Tower of Babel in the title banner was chosen because public discourse has become fragmented and even broken.